Dr.Pillai designed a Special Protection Yantra with 6 protection symbols & weapons carried by Divine beings. These weapons are effectively used against any and all negative forces. The Protection Yantra is very helpful because it provides divine protection without you having to think about it. All that you need to do is to keep that Yantra with you, put in on your desk or hang it on the wall. Even if you don’t look at the Yantra, it will do its job. 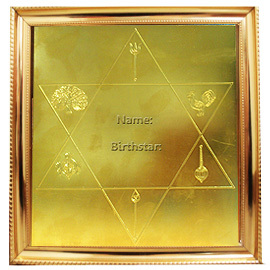 Please provide your Name and Birth star to be etched in the Protection yantra.